For nearly 60 years Sanguineti has been famous for having transformed and improved nautical customs. Today, just as we have done in the past, we have explored the know how of new technologies to anticipate what would be our future. Thus, Sanguineti has developed a product, created and projected by our Staff, which permits to move the gangway by the simple touch of a smartphone. How many times have you forgotten the remote control of the gangway in your car, inside your jacket, or the captain or the skipper had them or the batteries were flat? 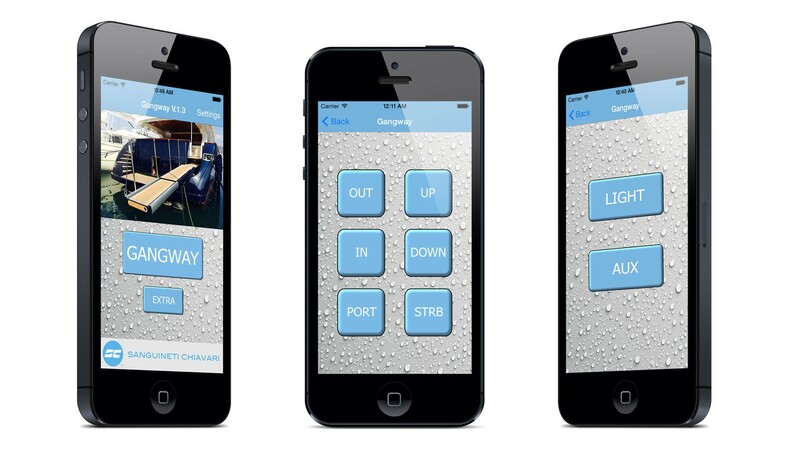 You no longer need 3 or 4 remote controls because as of today you can directly use your smartphone downloading our App. The system requires an interface which can be purchased at Sanguineti Chiavari. The interface is covered by a patent, built with quality parts tested by Sanguineti Chiavati, suitable for nautical purposes. The interface is connected to the switchboard of the gangway, in parallel to the system without causing any alterations to it. The interface is equipped with a router WiFi which enables the coverage up to a range of 20m. The Smartphone receives the signal and it connects just like a normal WiFi network protected with a password. It is an independent system which does not require the WiFi of the boat to work. Once it is connected to the network, thanks to the Sanguineti gangway Application, it is possible to use the telephone just like a simple remote control.